Here's a great video to watch on this product. The 3/4" x 12” premium, flexible engineered abrasive belts* sharpen virtually any shape or type of knife blade and uses a precision sharpening guide to ensure that you get a consistent angle every time. 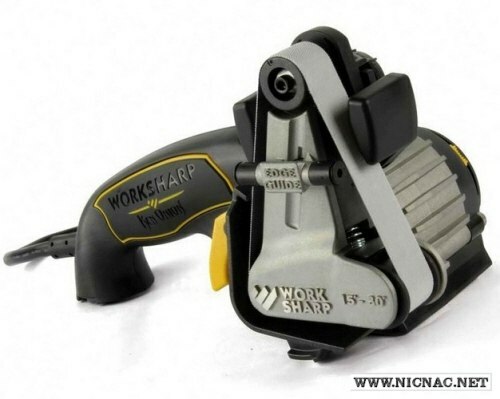 The sharpening guide is fully adjustable from 15° to 30° so you can sharpen any knife to the angle you desire to best meet your needs. The variable speed control (1200 SFM to 2800 SFM) provides you with the optimal belt speed for the task at hand. 1-year warranty on all WORK SHARP™ components; excludes abrasives. Warranty for consumer not industrial use. PLEASE NOTE: Using a 115V machine in a location with 230V power sources voids your warranty. * The 6000 grit belt measures 1/2" x 12" for better contact with serrations, guthooks and other hard to reach edges.